When many people talk about the various benefits of investing in real estate, they talk about real estate taxes and deductions. Why, you might ask? That’s right, Uncle Sam—the good ole U.S.A. Now, most people don’t think of the U.S. government as their friend, but most people are not real estate investors. If you are, and you know how to treat Uncle Sam right, he’s got some pretty terrific benefits in store for you when it comes to real estate taxes. We all know Uncle Sam has favored real estate investors in the past with generous real estate deductions and tax loopholes (many of which we will discuss in this article). However, you may not know that some of these benefits just got super-sized under the most recent tax reform. The super-sized benefits include bonus depreciation, more ways to defer taxes, and partial tax-free income for all sorts of real estate investors’ income. This post is going to dive deep (and I mean deep—over 3,000 words) into the benefits of real estate taxes you’ll get to enjoy as an investor. But first, the obligatory disclaimer: I am not a CPA. I’m also not a lawyer, doctor, or your mother. I’m a monkey in a room, frantically typing out words on a keyboard trying to produce Shakespeare. This information, while I’ve spent hours and hours researching, is still just my opinion on what I’ve learned. Please consult with a qualified (and real estate-savvy) accountant before making any decisions. That said, I did work with Amanda Han from Keystone CPA (my own amazing real estate taxes-friendly CPA) on this article to make sure my understand of real estate taxes was legit. If you need a CPA for your business, I highly recommend Keystone CPA. They do all my taxes, and my tax-life has become about a thousand times easier since I hired them. Now that we’ve got that out of the way, let’s get into this beast-of-a-post. Extra brownie points for those who make it through the whole thing. And to help, I’ve hidden a secret message in the text that will lead you to my buried treasure on a Caribbean island. Let’s get to the list, and we’ll start out with the most obvious one: deductions. As a rental property owner, you are able to deduct nearly all the expenses you’ll pay to manage your property—everything from the mortgage interest you pay on the loan all the way down to the paper you buy for your printer (if you are using that printer primarily for real estate investing purposes, that is). Of course, I’m not sure I’d necessarily qualify this as a “huge benefit” of rental property investing because you are still having to spend the money on those items. Who cares if you can deduct the cost of paper because you own a rental property? If you didn’t have the rental, you wouldn’t have had to spend money on the paper in the first place. However, where this deduction can come in handy are in the areas of your life that are shared with non-real estate activities. For example, if you have a home office, you may be able to deduct a portion of your home expenses (fax machine, internet bill, cell phone bill, mortgage interest, home repairs, etc.) equal to the portion that your office takes up in your house. Or if you need to drive up to check on your rental property and swing by the grocery store on the way back, you might be able to deduct the cost of your trip using the IRS standard mileage deduction (currently 58 cents per mile). The benefit of this, of course, is that it’s not like you wouldn’t have those bills anyway without a rental, so if you itemize those deductions carefully, you may be able to save significantly at tax time. You needed a cell phone, you needed that office, you needed that trip to the grocery store. Only now, you might be able to deduct some of them because of the business use. Things like meals, travel, and other similar expenses may also be able to be deducted, but don’t assume you can go to Disney World with your family and write off the whole trip because you spent a few hours looking at real estate. That’s called “cheating,” and you’ll likely find yourself in some hot water if you ever get audited. However, just like your home office deduction, perhaps you can deduct a portion of your expenses to help offset the costs some. Obviously—and I’ll say this numerous times in this post—talk to your CPA about what you can and cannot deduct. Short-term capital gains are gains made while holding the investment for one year or less, while long-term capital gains are gains made while holding the investment for over one year. As a rental property owner, it’s most likely you’ll have owned the property for longer than a year, so you’ll most likely only need to pay the long-term capital gains tax, which can be much more favorable than the short-term tax. Currently, there is not special tax treatment for short-term capital gains, so you’ll simply be responsible for paying tax at whatever your regular IRS-defined tax bracket is based on your income. For example, in 2019, ordinary tax rates range from 10% to 37%, depending on how much total taxable income you received during the year. On the other hand, in this same year, the long-term capital gains tax is either 0%, 15%, or 20%, depending on what income tax bracket you are in. 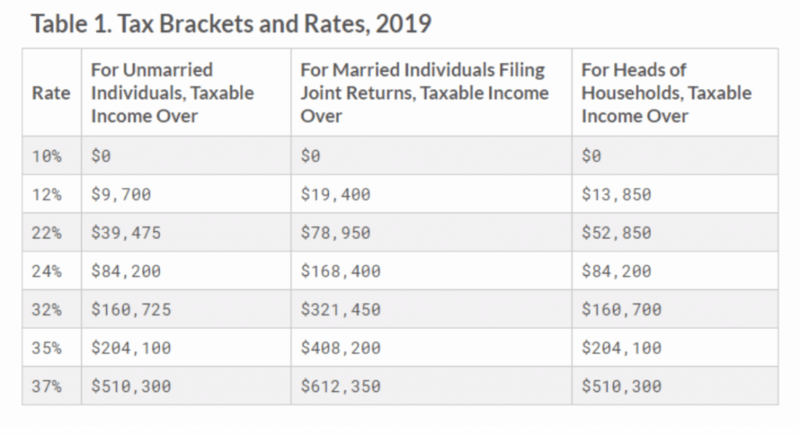 As you can see in the chart below, most married couples filing jointly in the 10% and 12% income tax brackets can pay 0% taxes on some or all of their in long-term capital gains, while those in the higher income brackets of 35-37% pay no more than 20% in long term capital gains, with most paying only 15%. In other words, let’s just say last year your neighbor made $60,000 per year as a self-employed business owner. You also earned $60,000, but $40,000 of your income came from rents and the other $20,000 came from a property you sold. Your neighbor’s $60,000 was taxed at 22%, but he also had to pay 15% in self-employment tax. You, on the other hand, paid $0 in taxes on the $20,000 in capital gains and no self-employment tax on any of your income. The only tax due was your 12% income tax on the $40,000 in rental income, but with all the deductions (including depreciation, home office, car, and travel expenses)—and possibly the Section 199A 20% Pass-Through Deduction—you ended up paying next to nothing, while your neighbor lost almost a third of his income to the IRS. Same income amount, far different tax treatments due to real estate taxes. Man, it feels good to be a real estate investor. One of the deductions you’ll be able to claim on your real estate taxes each year is so powerful it deserves its own section here! Depreciation is a deduction taken on materials that break down, but not all in one year. It’s not a concept unique to real estate, but is used in most businesses in America. To understand the concept, let me try to explain it in more detail. Let’s pretend you own an office supply store and you need to purchase a new $5,000 printer for your business. Because the printer is a business expense, the IRS allows you to deduct or “write off” the cost of the printer. However, the IRS knows that the printer is going to last more than one year, so they don’t want you to write off the entire cost of the printer in the year you bought it. That would be too easy. Instead, you have to spread out the deduction over the life of the printer, as defined by the IRS in Publication 946, Appendix B. (In this case, the IRS says a printer is depreciable over five years.) So, you could deduct a portion of the $5,000 the first year, another portion the second year, and so on until you depreciate the entire printer. You are still getting to deduct the total cost, but you must do so over time. Some years, like this year (2019), the IRS allows you to deduct the entire expense of equipment like that printer we are talking about. Instead of requiring that you deduct over a period of five years, they let you deduct it all at once in the current year, taking advantage of something commonly referred to as “bonus depreciation.” Even better, right? Qualifications for this “bonus depreciation” vary by year and by individual type of equipment, so be sure to consult with your CPA for specifics on real estate taxes. The IRS has determined that the deductible life of a piece of residential real estate is 27.5 years, and for commercial real estate, it is 39 years. In other words, as a rental property owner, you are able to deduct the value of your building over that length of time. “But my property isn’t going to disappear in 27.5 years!” you exclaim. And you are right. This is why depreciation may be a benefit to you, the landlord. We all know that property values generally go up over time, and anything that breaks down on the property we are able to deduct separately anyway. Therefore, depreciation on real estate is often known as a “phantom deduction” because although we deduct the cost, the actual loss never really occurs. Therefore, we are able to “deduct” $3,091.00 every single year for the next 27.5 years on the property. Now, how does this come in handy? Well, let’s say that your rental house produced $250 per month in cash flow for you after all the income and expenses have been calculated. Normally, as an investor, you would need to pay taxes on that income because, of course, it is income. That cash is what’s left over in your rental business. But because of depreciation on the property, you won’t pay any taxes on that (yet). That $250 per month works out to $3,000 in income over the year, but once you deduct the depreciation expense of $3,091 per year, you find that—on paper— you actually LOST $91 on your rental property. This is what is known as a “paper loss” because, of course, on paper it looks like you lost money, but in reality, you made money. Try doing that with your W-2 job—it’s not going to happen. Now, that was a small example of depreciation on a single-family house. Think of what could happen as you grow your portfolio. Imagine if you owned $2,000,000 worth of real estate, and, let’s say, 85% of that is depreciable. Now you are looking at $61,818 per year in deductions on the income you make from those properties, even though you never actually experienced that loss. Does that seem too good to be true? As much as I want to believe that the IRS is my friend and we could hang out together, grab some drinks, and talk about life, that’s not entirely true. The IRS is out to get all the money it deserves, and, as such, the piper may still need to get paid. This is usually done when the real estate property is sold. That’s right: All that money you “deducted” over the years of owning the rental property may be paid back to the IRS in a process known as “recapture of depreciation.” Currently, that amount is taxed at a hefty 25%. Perhaps the best way to explain this is by using an example. Let’s go back to that same example we talked about earlier with the $100,000 house, depreciated at $3,091 per year. If we owned the property for 10 years, we would have deducted $30,910 in total during those years and not had to pay taxes on that amount. However, when we sold, that $30,910 may be taxed at a 25% rate, in addition to any other capital gains taxes you would need to pay with the sale. Depreciation doesn’t seem so great after all, does it? And if you’re thinking, “Well, I just won’t take the depreciation on my taxes,” think again. The IRS may require a person to pay that 25% recapture of depreciation charge no matter what, whether or not you took the depreciation. So, of course, you better take the depreciation or you’ll be paying taxes twice to the IRS. Hopefully, if you are selling the property, you’ll be making a pretty good profit. After all, the longer you hold the property, the more of the property you will have paid off, resulting in more equity and more cash at closing. Hopefully the property has climbed in value as well, more than the depreciation cost. During all this time that you didn’t have to pay taxes on that income, you were essentially using the government’s money tax-free. So even if you do have to pay it back at a 25% rate (which might be lower than your income tax rate anyway), it’s still not due until you sell. Just think: The IRS could have charged you that amount each year. There is one surefire strategy you can use to avoid paying the recapture of depreciation tax—through the use of a 1031 exchange. In a 1031 exchange, also known as a like-kind exchange or a Starker exchange, an investor can purchase another property and carry the proceeds and the tax basis forward into the next property. Essentially, you could continue to do this for the rest of your life, always trading up to the next big deal and never paying that tax. Of course, someday when you finally do cash out, you’ll have a large accumulated tax bill, but likely you’ll be so rich it won’t matter—or you’ll be dead. Either way, win! Well, since we touched on the 1031 exchange, let’s talk about that next. The 1031 exchange is a legal strategy used by many savvy real estate investors to bypass that whole “paying taxes” thing when they sell. Named after the IRS tax code that brought the exchange into existence (Section 1031), the 1031 exchange allows an individual to sell an asset and carry their basis forward into a new, higher priced property. In other words, a real estate investor can use this tax code to sell a property and use the profit to buy a new one—and kick the can down the road and defer paying real estate taxes until that next property is sold (unless, of course, they use another 1031 exchange). I know, that’s confusing. Let me explain it with a story. John has owned a duplex for several years, and over time, the property has gone up in value considerably. He purchased the property for just $75,000, but today it’s worth almost $200,000. If he were to sell, he’d likely be stuck with paying a long-term capital gains tax on all that sweet profit, as well as the recapture of depreciation. If his long-term capital gains tax rate was 15% and his profit was $125,000, that’s $18,750 directly to the IRS for the capital gains tax and potentially another several thousands dollars for the “recapture of depreciation.” But not if he uses a 1031 exchange. John instead takes that money in profit and uses it as a down payment on another property—a $1,000,000 apartment complex. Because he didn’t have to pay that $18,750 to the government, John was able to use it as part of his 20% down payment, allowing him to afford to buy another $93,750 worth of property (because 20% of $93,750 is $18,750). Imagine if five years later John does the same strategy again, and again, and again. He could continue to invest in increasingly expensive properties, growing his net worth without needing to fork over money to the IRS each time. Thanks, real estate taxes. The exchange must be for a “like-kind asset.” In other words, you can’t sell a house and buy a McDonald’s franchise. However, “like-kind” is a loosely defined term, so you could sell a house and buy an apartment, a piece of land, or a mobile home park. There are time limits. After the sale of your property, the clock starts ticking on two important timelines: the identification window and the closing window. The IRS requires that you identify the property you plan to buy within 45 days (you can identify three possible properties), and you also must close on that property within 180 days. For those experienced real estate investors out there, you probably are already thinking, “Well, that doesn’t seem to be a lot of time!” You are right. The IRS, for some unknown reason, makes investors move very quickly to make the 1031 exchange happen. You can’t touch the cash. Finally, when you sell your property, you cannot touch the profit from the sale. Instead, you must use an intermediary who will hold onto the cash while you wait to close on the new deal. Keep in mind, you can take out some of the profit; you’ll just need to pay taxes on whatever you touch. As you can see, these rules may make it difficult to properly carry out a 1031 exchange, especially when good deals are hard to find. There is no sense in buying a terrible property just because you want to avoid paying a 15% tax on your profit. For this reason, some investors simply pay the tax and avoid the 1031. But for those who are willing to take on the government’s “1031 exchange challenge,” faster growth and larger profits can result. In 2019, a new benefit for real estate taxes known as the Opportunity Zone provides an alternative to the 1031 exchange that also allows a taxpayer to defer capital gains taxes on the sale of a property. In addition to tax-deferrals, the Opportunity Zone property may also provide you with tax-free growth if the property is held over a 10-year period. Why would the IRS provide this tax benefit to investors? Well, it is an effort by the government to incentivize investors to revitalize certain areas within the U.S. market where housing improvements are needed. Another tax benefit of investing in rental properties is that the income you received is not generally taxed as “earned income” and therefore not subject to a major tax most Americans pay: the FICA/self-employment tax, which helps to fund Social Security and Medicare. FICA (short for Federal Insurance Contributions Act) is a term that you’ve likely seen on your pay stub if you have a W-2 job. This is a 15.3% tax that is split 50/50 between the employer and the employee. Of course, if you are self-employed and have no employer, you are responsible for the full 15.3%, which is known as self-employment tax. As you know, 15.3% is no laughing matter, but luckily for real estate investors, we have something to laugh at! The U.S. government does not currently look at rental real estate as a job or self-employed business, so that tax is generally not due. Keep in mind, however, that this may depend on how you legally structure your real estate holdings. Certain strategies, like holding properties in a C corporation and paying yourself a salary or paying yourself a management fee, could trigger the FICA tax, so check with your CPA to make sure you are optimized for the best tax treatment. Next, let’s talk about one of my favorite benefits of real estate taxes for investors: tax-free borrowing! Imagine with me that you own a piece of real estate worth $200,000, but you only owe $100,000 on that property. You could potentially take out a line of credit on that property OR refinance the property to pull out your equity. So, let’s just say we went to the bank and refinanced that property for $160,000, obtaining a brand-new loan and paying off of the old one. After paying the original $100,000 loan off, we have $60,000 left over to do pretty much whatever we want with. The best part is, although this is cash in your pocket that you just pulled out of thin air, you don’t need to pay taxes on this. Of course, this makes sense since you didn’t actually sell anything. But it’s not often you can get a big chunk of money and not pay taxes. Sure, you’ll need to pay taxes someday when you sell the property, but you can use that money right now with no tax at all. Use it to buy more rentals, lend to other investors, or take a trip to Fiji. It’s your money, do what you want—tax-free. Even better, if the proceeds from the refinance was used to improve your primary home or for another investment property, you may be able to deduct the interest paid on that loan! So, not only can you borrow the money tax-free, but you can possibly lessen your tax bill at the end of the year for doing so. Taxes (and real estate taxes) are inevitable, as is death. But the IRS actually seems to like real estate investors, unlike the rest of the working world, so the sting is not quite as sharp. The U.S. tax code is incredibly complex, and every strategy has rules that must be followed, exemptions that are allowed, loopholes that only the rich seem to know about, and penalties if not performed correctly. For this reason, it is absolutely imperative that you talk with an investor-savvy CPA about real estate taxes when plotting your tax strategy. I’ve been investing for almost 10 years now and still barely understand the concepts I just tried to explain to you. You cannot do this on your own; you need help. And remember, as you build wealth, a good CPA versed in real estate taxes will save you more money than they cost. And they might just keep you out of jail! Want to learn how you could be saving more on your real estate taxes using loopholes, deductions, and more? Get the inside scoop from Amanda Han and Matthew MacFarland, real estate investors and CPAs, in Tax Strategies for the Savvy Real Estate Investor. Pick up your copy from the BiggerPockets bookstore today! If you made it to the end of this post, you probably have a question, comment, or some more insight to provide on real estate taxes.